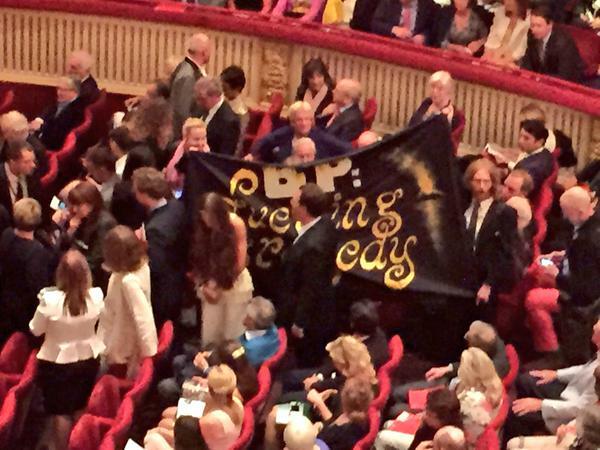 Royal Opera House hit by double protest during BP-sponsored opera – BP or not BP? Posted on June 11, 2015 by BP or not BP? 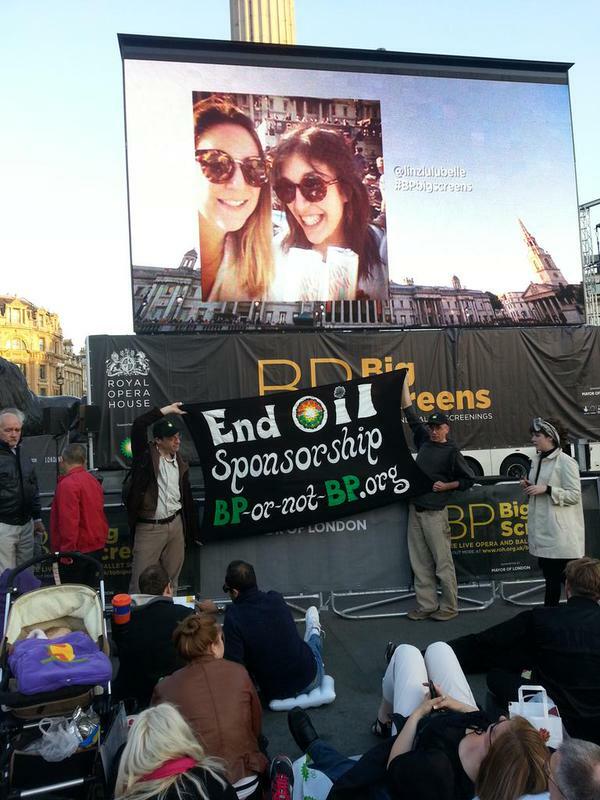 Last night, the Royal Opera House was hit by two simultaneous protests against its BP sponsorship during its first “BP Big Screen” of the year, where an opera in Covent Garden is transmitted live to big screens and cinemas across the UK. As the interval of the BP-sponsored opera drew to a close, two young composers stood up in the stalls of the Royal Opera House and began to sing about BP’s damage to the Gulf of Mexico and unfurled a banner with the words, “BP: Fuelling Tragedy.” Earlier in the performance, two activists at the “BP Big Screen” event in Trafalgar Square gate-crashed a presenter’s piece to camera, causing their “End Oil Sponsorship” banner to be shared live on screens across the UK. They’ve got to go, go go! Despite heavy-handed security wrestling the banner from their hands, the pair continued to sing loudly as they paraded out of the auditorium, where applause for their protest had begun to break out. At the start of the evening’s opera, a member of Royal Opera House staff had come on stage to thank BP for their “longstanding support”. During an earlier scene change, two activists from the anti-oil sponsorship group, “BP or not BP?”, unfurled a banner behind a live piece to camera taking place in Trafalgar Square by the conductor and presenter, Dominic Peckham. 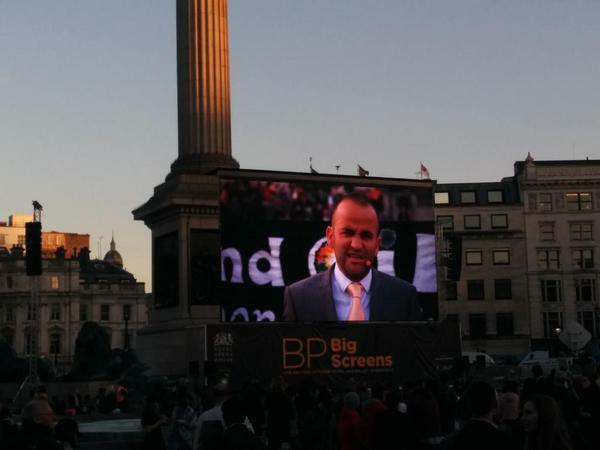 Their “End Oil Sponsorship” banner filled the screen’s background and was transmitted live to screens across the UK, before they were eventually ushered away by security staff. BP paid the largest criminal fine in US history of $4.5 billion after admitting guilt to fourteen charges over its Deepwater Horizon spill in the Gulf of Mexico. BP also admitted to having lied to US Congress during the disaster. BP has recently been criticised for its close relationship with the Aliyev regime in Azerbaijan, a regime with a record of human rights abuses and which currently has over 100 political prisoners. The Royal Opera House is one of four major cultural institutions sponsored by BP as part of a five-year deal, along with the British Museum, the Tate galleries and the National Portrait Gallery. All four institutions have witnessed an increase in protest over their controversial sponsorship deals with the oil giant. 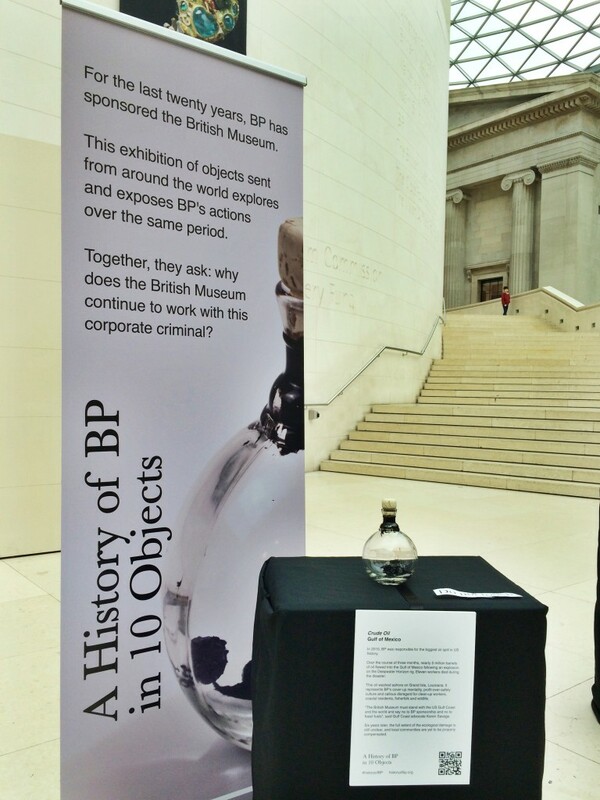 Under the Freedom of Information Act, the British Museum and the Tate have recently been forced to reveal that BP’s donations make up less than 1% of their overall income – an “embarrassingly small” amount, campaigners say. Oil sponsorship of cultural institutions has been high on the news agenda after it was revealed last week that Royal Dutch Shell attempted to influence the Science Museum’s decisions in relation to its climate science exhibition, ‘Atmosphere’ and related events.